I have wanted to use mask for long time, yeah few like I haven't use any for at least two weeks. 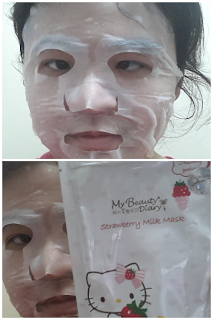 Above mask is Strawberry Milk Mask the purpose is whitening and smoothing. My skin feels good after using it. It is recommended for dull and tired skin. Every mask packaging has the direction of usage, you can refer to that. On this back of this mask stated if there is discomfort and swelling after use, please stop and consult your dermatologist! Do not use this product over a would or swelling; people with sensitive skin are recommended to perform patch test for sensitivity; any advert reaction, please stop using. Don't forget to find out how you can win the Hello Kitty colouring book, click link to find out.